Derived from the ancient Sanskrit word for 'bowl', JAAN is an internationally recognised modern French restaurant in Singapore that has established itself as a gastronomic platform with a reputation for handpicking and grooming exceptional culinary talents. The intimate 40 seat restaurant has a sophisticated interior that features an elegant private dining room for exclusive events as well as a stunning Murano crystal and silver free-form chandelier that spans the entire length of the ceiling. 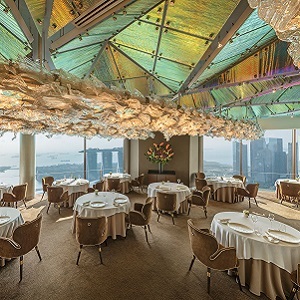 The beauty of the chandelier is only outdone by two things: the breathtaking view of Singapore’s scenic landscape as well as the truly exquisite culinary and service experience that have become the hallmark of this multi-award winning restaurant. I would like to thank you from the bottom of my heart for making my friend’s day, month and year for her birthday. Your staff are amazing, particularly the charming Simone Macri, who I think my friend has a crush on, but the head chef, who my wife Gerry Ang has worked with before at an event for Credit Suisse was such a charming young man and is clearly truly gifted!! I know they only give three Michelin stars, but you, sir, Mr Westaway, deserve ten at least!!!! It was very enjoyable. The view was splendid. The food was exquisite and very delicious. My friend celebrated her birthday and received a complimentary cake. The sommelier was very informative and taught us how to open a wine bottle without damaging the cork. It was our first visit and will definitely be back again. Food was amazing, every dish was perfect. The view from the 70th floor was to be expected, splendid. The service was warm and welcoming adding to the already great atmosphere. We had really nice and most tasty dinner, we definitely visit here again. Very nice hospitality with excellent team ! There are bones in my fish dish. I have feedback to your colleague at the restaurant. Great atmosphere and view. Very good service. Kirk Westaway is a prodigy. You can taste the greenery of Devonshire in his cooking, wrapped as it is with complexity of modern cuisine. He reminds me of the young Chris Kostow (now 3 Michelin star holder) in California....brimming with talent with an instinct for flavour and lyrical composition. But Kris is more talented I think:  there is humour, intelligence and wit in his cooking that sets it apart. The whole meal was an unspoken conversation with the chef. We will be back. The reservationist, Elaine, did an exceptional job working with us for a special occasion. Brava! Very warm and kind reception! I felt very special and proud that I brought my friends to the right place! The cuisine is amazing, the view from the restaurant is fabulous and team is very welcoming. We really enjoyed special attention to us. My guests were impressed by the food, restaurant atmosphere and great service. Just perfect place for any special occasions. Beyond our expectations thank you. Every part of this experience was perfect. Food magnificent and service perfect. Food was great. Service was great. I would just change the music, but that’s just my humble opinion. Otherwise, everything was great! Views were amazing! Superb food, great ambience, wonderful and helpful staff. Thank you for the special birthday cake surprise. It was a lovely meal at Jaan, the staff were very friendly and patient in explaining every dish, the view was stunning and the food was delicious and worth the money! Absolutely wonderful, from the service of the staff to the views and the food, a definite go to! Everything was on point! Great great place. Will definitely return. Only one thing less than perfect - the dessert. WE INTENDED TO HAVE BUFFET WHEN BOOKING, BUT WE WERE TOLD THERE WAS NO BUFFET UNTIL WE ARRIVED WITH OUR GUESTS. IT IS  so awkward TO HAVE TO TAKE SET LUNCH. Supremely satisfying lunch experience. A must try, exquisite tastes and unparalleled service. Go, go, go! !